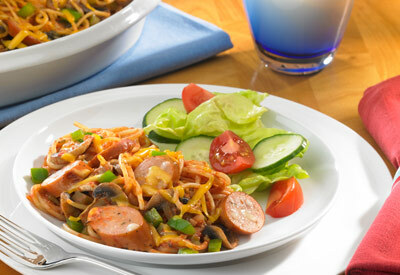 Enjoy a new way to do spaghetti! This delectable, mouth-watering authentic Italian dish is sure to please! Preheat oven to 375 degrees F. Lightly grease a 3- quart casserole dish. Bring pot of water to boil and cook pasta according to package directions. Heat olive oil in large pot over medium heat, add onion, garlic and cook 2 minutes. Add sliced sausage and cook 5 minutes. Stir in bell pepper, mushrooms, salt and seasoning until soft, about 4 minutes. Add tomatoes, 3/4 cup water and basil. Simmer until sauce thickens 20 to 25 minutes. Add cooked pasta and toss to combine. Spoon half into casserole dish and sprinkle with half the cheese, spoon remaining pasta and sprinkle with cheese. Cover with foil sprayed with cooking spray bake 20 minutes, until cheese is golden.